The ASCCA Membership Committee proudly announces Jerry Kubitsky of Summit Transmissions & Auto Care as its ASCCA member of the month for May 2018. Every month, the ASCCA honors members who have continuously excelled in the demonstration of ASCCA’s core values of integrity, compassion, professionalism, and unity. Along with these core values, Jerry has proven to go above and beyond in demonstrating support for ASCCA’s core purpose: To elevate and unite automotive professionals and give them voice. Jerry specializes in the repair and rebuilding of transmissions, however, Summit Transmissions & Auto Care is now a full-service auto shop. 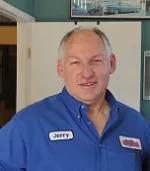 Making the transition to a full-service auto care shop has been difficult but Jerry stated that it has been worthwhile since the customers love the detailed full-service work at Summit Transmissions & Auto Care. Thank you Jerry for your continuous dedication to ASCCA. Our organization and its members have experienced marvelous improvements from your participation, compassion, integrity, and of course, your commitment.